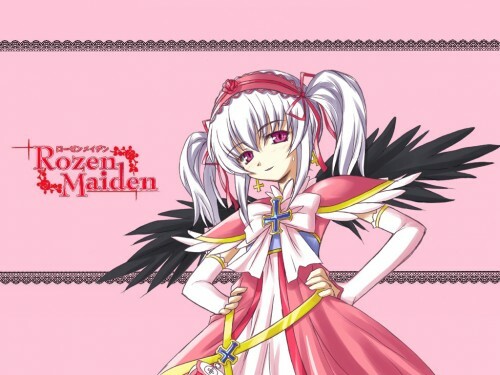 I haven't seen rosen maiden before(or is it a manga? ), but whoever Suigintou is, is sure cute! lol, great job! The colours match really well with a simple but effective wall. Nice Job. Aww, what a cute Suigintou...it's kinda creepy though, she's not supposed to be so...pink ^_^ "Watashi janku ja nai no...pinku desu!" heehee...anyway, neat work! a.............. Oh Suigin Tou Custom, or suigin Tou Mk II, are she is reborn from her graveyard in Jun Dream, BTW i verry happy if she not die. Remove the logo at the left and you'll have an OK wall. that is a nice pic of suigintou lol she looks good in pink . Sigh, a suigintou without her fierce face and dark pitch clothes isn't SUIGINTOU . Suigin Tou looks childish! Kawaii! Very nice pic - kind of caught me off guard a tad (pink).